American DJ Micro Hypnotic Laser DJParts - All Variety of Parts that DJ Needs. 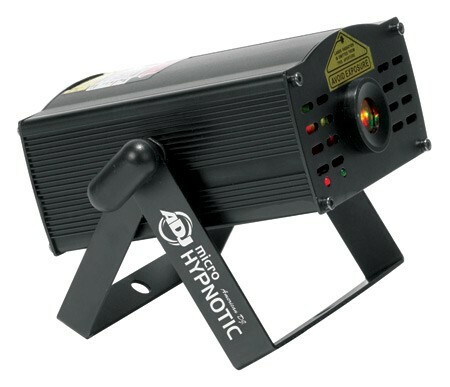 Laser patterns can be projected on a dance floor, ceiling or wall Compact case design 2 operational modes: Auto Mode (built-in programs), or Sound Active Mode Built-in programs can be changed with a push of a button on the unit or from the RF wireless remote Includes dual hanging bracket Complies with FDA standards Fan cooled Green Laser: 30mW (532nm) Green laser Red Laser: 80mW (650nm) Red laser Includes UL Listed multi-voltage power supply: 12V DC 100-240V, 50/60Hz Includes RF Wireless Remote Control [Auto/Sound Control; Black Out; Color Change (R, G, R+G, Random); Rotation Control (Clockwise/Counterclockwise/Random)] Dimensions (LxWxH): 6”x4.75”x2.5” / 149x110x60mm Weight: 2 lbs. / .8 kg.